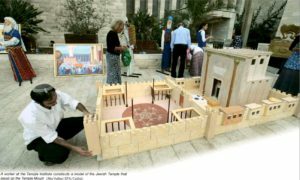 Is it time to build Israel’s Temple? 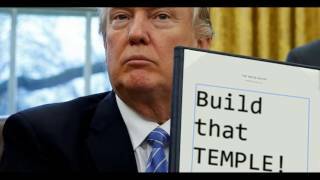 Israel’s Sanhedrin calls on President Trump to build the Temple in Jerusalem! 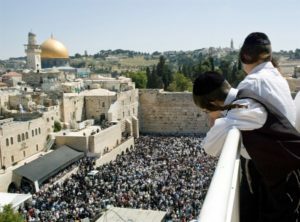 The Jewish Temple Mount leaders are excited over the election of Donald Trump. 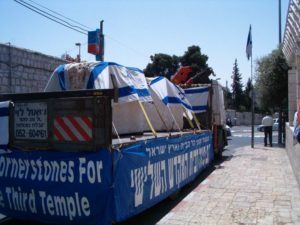 They know very well that rebuilding Israel’s Temple in today’s world would be a dangerous and politically incorrect task. In their view, if there is any modern political leader with the guts and determination to stand behind such a project, it could be President Donald Trump. The prophecy showing Israel’s Temple in Revelation 11 was written 25 years after the temple of Herod (the second temple) was destroyed by the Romans in 70 AD, and can therefore only refer to a future rebuilt temple – the Tribulation Temple in Jerusalem. The Tribulation Temple, which will be completed and put into service during the first half of the Tribulation period, will be desecrated by Antichrist at the mid point of the seven year Tribulation. “Then he (Antichrist) shall confirm a covenant (Peace Treaty) with many for one week (Seven years) but in the middle of the week he shall bring an end to sacrifice and offering” (Dan. 9:27). The Temple Institute in Jerusalem has spent approximately $30,000,000 on preparations for rebuilding the Jewish Temple. All the temple articles are completed, including the brazen altar mentioned in Revelation 11:1. 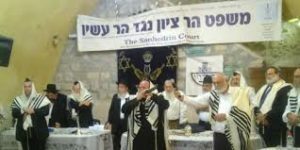 The Jewish Sanhedrin, has been re-established in 2004 after a hiatus of 2,000 years. 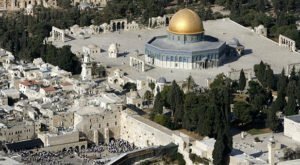 Israel’s religious leaders are now regularly calling for the rebuilding of Israel’s temple as the way to world peace and religious harmony. Any Peace Treaty with Israel must resolve the building of Israel’s Temple. The Sanhedrin is the ruling spiritual authority in Israel comprised of 71 Rabbi Elders. Within days of his election, the re-convened Jewish Sanhedrin sent a letter to President Trump – asking his assistance to fulfill their mandate of rebuilding of the Temple. Rabbi Hillel Weiss, who serves as spokesman for the Sanhedrin, explained that Donald Trump’s rise to power had ‘made the eternal Jewish dream a very real possibility’. 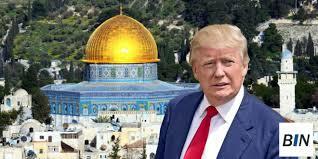 Trump’s strong stand in support of the Jewish claim to Jerusalem and the West Bank (Biblically known as Judea and Samaria) has led the Sanhedrin to the belief that he could also support full Israeli rights to the Temple Mount. Sitting atop Mount Moriah today is the Temple Mount, a 37-acre tract of land where Solomon’s Temple once stood. Revelation 11 shows that Israel will have a temple there during the Tribulation. The temple will be rebuilt in the first half of the Tribulation as part of Israel’s agreement with Antichrist. Once Israel’s Temple is constructed, Israel will begin to offer animal sacrifices as they did in the time of Christ. This will take place during the first half of the Tribulation, during the time of the ministry of the Two Witnesses (Rev. 11:3-14) under the treaty between Israel and Antichrist (Dan. 9:27). While Revelation 11 begins with the prophecy of the Temple (vs. 1-2), the rest of the chapter describes the ministry of Moses and Elijah who return to teach Israel and call them back to God (vs. 3-14). After the Rapture, God sends His 2-Witnesses to teach Israel the true purpose of the Temple and the purpose of bloody temple sacrifices. The sacrificial system pictures Jesus, Israel’s Messiah, the Lamb of God. Their teaching over the first three and a half years of the Tribulation will have a profound spiritual impact on Israel and the world. Israel’s two greatest teachers will call Israel to repentance and stir the greatest revival in Israel’s history. 2. Measure the Altar – “Altar” here refers to the large brazen altar and the area where the animal sacrifices are offered by the priests. 3. 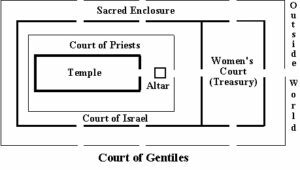 Measure those who worship there – In Israel’s previous temples, this is a reference to the “court of the women” (see diagram) where both men and women gathered to observe the sacrificial ceremonies. The Tribulation Temple on the Temple Mount and the outside altar area are to be literally measured whereas the presence of the worshipers is merely to be noticed and recorded. The ancient measuring device John used was the stalk of a reed like plant (“rod”) that grew in the Jordan Valley to a height of fifteen to twenty feet. The stalks were long and lightweight and ideal for use as measuring rods. The outer court is called the “Court of the Gentiles” and is a reference to Islam’s control over the Temple Mount today. Satan has deceived Muslims into capturing the Temple Mount who regard it as their third most holy site after Mecca and Medina. On the Mount (Mount Moriah) sits both the Dome of the Rock, directly over the location of Israel’s former Temple and the Al-Aqsa Mosque. 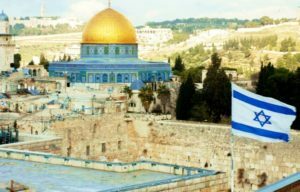 God’s message concerning their stranglehold on Israel’s holiest site is that their days are numbered. 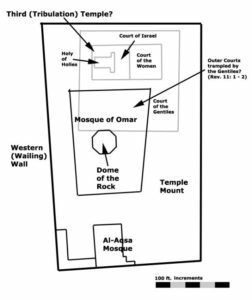 From the following diagram, you can see how the “Court of the Gentiles” could easily overlap into Islam’s Dome of the Rock area precisely fulfilling this prophecy. Say what? Islam has No Rights to the Temple Mount? (1) John is told not to measure the Court of the Gentiles. (2) It is to be left out because it is cast out and rejected by God. (3) God has rejected the Islamic interlopers who usurped the Temple Mount and captured it in 700 AD. They are rejected because their blasphemous religion rejects the Son of God and follows the false god Allah. Islam has no legitimate historic rights to the Temple Mount or Jerusalem and now they are told by God they must share it with Israel’s coming Tribulation Temple. (4) In their rebellion to God, the Gentile Islamic Caliphate, led by Antichrist, will “trample on the holy city for 42 months” (vs. 2). Antichrist will take over Israel’s Temple and Jerusalem throughout the second half of the Tribulation. 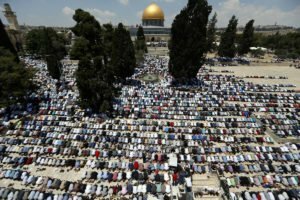 Palestinian Muslim worshippers attend the first Friday prayers of the Muslim holy month of Ramadan outside theDome of the Rock at Jerusalem’s al-Aqsa mosque compound on June 2, 2017. The Apostle John prophesied that Israel would have a sharing relationship with heathen Gentiles and would be forced to share the Temple Mount during the Tribulation. Israel and Islam, sharing the Temple Mount is now a reality and these phenomenal end-time events are unfolding before our very eyes!